Many glaciers in West Antarctica have substantially increased their rate of shrinkage compared with the 1990s. US-Chilean teams report to the journal Science that the glaciers are losing 60% more ice into the Amundsen Sea than they accumulate from inland snowfall. They say the ice loss corresponds to an annual sea-level rise of 0.2mm, or more than 10% of the total global increase of about 1.8mm per year. The study incorporates satellite data and measurements from aircraft. It also shows the glaciers are moving faster. One, the Pine Island Glacier, has sped up by about 25% over the last 30 years. Bob Thomas, who is attached to the US space agency's (Nasa) Wallops Flight Facility and one of the authors on the Science report, cautions that the observed changes apply to only a short time period. It is too early, he says, to tell if the accelerated thinning is part of a natural cycle or is a sign of a longer-term change. "Continued observation is important," he added. And Eric Rignot, a study participant from Nasa's Jet Propulsion Laboratory, said: "The rates of glacier change remain relatively small at present... 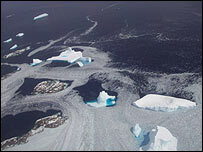 But the potential exists for these glaciers to increase global sea level by more than one metre. "The time scale over which this will take place depends on how much faster the glaciers can flow, which we do not know at present." 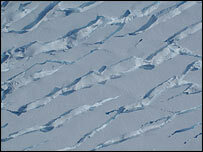 A major factor will be the behaviour of the huge ice shelves that the glaciers flow into before reaching the sea. This has been illustrated by a separate piece of research published earlier this week in Geophysical Research Letters. It demonstrated how glaciers on the Antarctic Peninsula once bounded by the Larson B shelf, which collapsed in 2002, are now flowing significantly faster into the Weddell Sea.